The first inauguration of Richard Nixon as the 37th President of the United States was held on January 20, 1969. 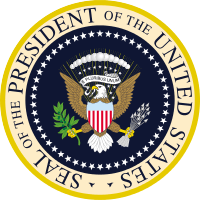 The inauguration marked the commencement of the four-year term of Richard Nixon as President and Spiro Agnew as Vice President. Chief Justice Earl Warren administered the Oath of office to Nixon, and Senate Minority Leader Everett Dirksen administered the oath to Spiro Agnew as Vice President. Four Vice Presidents: L-R, outgoing President Lyndon Johnson (the 37th Vice President), incoming President Richard Nixon (36th), Senate Minority Leader Everett Dirksen, Spiro Agnew sworn in as Vice President (39th), and the outgoing Vice President Hubert Humphrey (38th), at inauguration, January 20, 1969. When we listen to "the better angels of our nature," we find that they celebrate the simple things, the basic things--such as goodness, decency, love, kindness. I do not offer a life of uninspiring ease. I do not call for a life of grim sacrifice. I ask you to join in a high adventure--one as rich as humanity itself, and as exciting as the times we live in. In that moment of surpassing technological triumph, men turned their thoughts toward home and humanity--seeing in that far perspective that man's destiny on earth is not divisible; telling us that however far we reach into the cosmos, our destiny lies not in the stars but on Earth itself, in our own hands, in our own hearts.